A REPUBLICAN EASTER - IRELAND, LONDON AND NEW YORK. 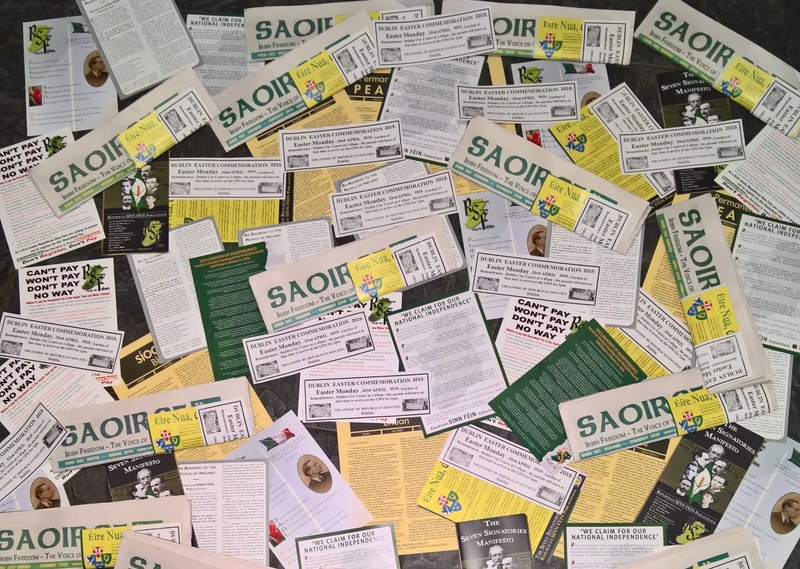 Between Thursday, 18th April 2019, and Easter Monday (22nd April), RSF members and supporters in the Dublin area will be distributing 1,500 leaflets of a republican nature which have been collated into various size 'packs' (see pic), each containing between three and five items. The main Dublin commemoration will be held on Easter Monday, and those attending are asked to assemble at the Garden of Remembrance in Parnell Square, from where the parade will leave at 1.45pm, to make its way to the GPO in O'Connell Street, for 2pm but, if you can't make it your business to get to that one, here's a list of other Easter commemorations for your perusal(!) - and if you feel like sponsoring myself and four other young wan's to get to the New York commemoration, we'll gladly take you up on the offer! ANTRIM - Easter Sunday, Belfast, Republican Plot, Milltown Cemetery, assemble 11.45am at home of James Connolly, Falls Road. ARMAGH - Holy Saturday, Lurgan, Edward Costello Memorial Garden, 1pm and, also that same day, Armagh city, assemble Republican Plot, Sandyhill Cemetery, for wreath-laying ceremony, 4pm. CARLOW - Holy Saturday, wreath-laying ceremony, Republican Plot, St Mary’s Cemetery, Carlow town, 2pm. FERMANAGH/CAVAN - Easter Sunday, wreath-laying ceremony at Republican Sinn Féin Memorial, Mullan, Swanlinbar, on Cavan/ Fermanagh border, in memory of Vol Pat McManus and James Crossan, 2pm. Other wreath-laying ceremonies throughout the counties organised locally. CLARE - Easter Sunday, Wreaths will be laid at the Manchester Martyrs Monument and the Holocaust ('famine') Monument in Kilrush and at the grave of Connaught Ranger Joseph Hawes ; in Kilmurry McMahon at the grave of Martin Calligan ; in Doonbeg Cemetery in honour of Capt Michael McNamara, Comdt Willie Shanahan and Vol Patrick O’Dea, and Kilmihill Cemetery at the grave of Seán Breen. CORK - Easter Sunday, wreath-laying at Republican Plot, St Finbarr’s Cemetery, Cork. DERRY - Cúchulainn Memorial, City Cemetery, Derry City, Easter Sunday, assemble at 12 noon. Wreath-laying ceremonies at the following on Easter Sunday morning : The Loup Cemetery, 9am, at the grave of Brigadier Seán Larkin; and the grave of Tommy Toner in Dungiven, 10.15am at the graves of Vols Kealy, O’Carolan and Kilmartin and hunger striker Kevin Lynch. DONEGAL - Wreath-laying ceremonies at Doneyloup, Castlefin, Clady Bridge will take place over the Easter weekend and Drumboe, Easter Sunday, assemble at the Old Fire Station, Stranorlar for march to the Drumboe Martyrs Memorial, 2.15pm. DOWN - Easter Sunday 10.30am, Assemble St. Mary’s Cemetery, Newry for wreath-laying ceremony. DUBLIN - Easter Sunday, laying of wreath and the reading of the 1916 Proclamation at the Éamonn Ceannt Monument, Sundrive Park, Crumlin, at 12 noon, followed by commemoration at Deansgrange Cemetery, 1pm and Easter Monday ; assemble Garden of Remembrance, 1.45pm for march to GPO, O'Connell Street, for 2pm. GALWAY - Good Friday, wreath-laying ceremony at the Workhouse, Tuam, 5pm. Holy Saturday, wreath-laying ceremony, Kilcummin Cemetery, Oughterard, 7pm. Easter Sunday, Galway City, assemble at Cathedral at 11am for parade to Liam Mellows Monument, Eyre Square. 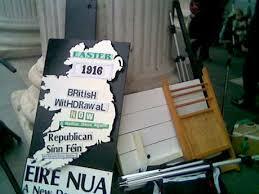 Easter Sunday, commemoration Republican Plot, Donaghpatrick, Headford, assemble Queally’s Cross, Cahirlistrane, 3pm. KERRY - Holy Saturday, wreath-laying ceremony, Republican Plot, Castleisland Cemetery. Easter Sunday, Cahersiveen, assemble 2.30pm at the Monument, The Square. Tralee, Easter Sunday, assemble at Denny Street at 1.45pm for parade to Republican Plot, Rath Cemetery. Easter Sunday, Killarney, wreath-laying ceremony at Republican Monument. Easter Monday, Republican Plot, Listowel, wreath-laying ceremony, assemble at graveyard gates, 2pm, and wreaths will be laid at Republican graves throughout the county. KILDARE - Holy Saturday, wreath-laying ceremony, Grey Abbey, 12 noon. KILKENNY - Holy Saturday, wreath-laying ceremony, Rathciaran, Mooncoin. LEITRIM - Holy Saturday, 3pm, Bornaculla. LIMERICK - Easter Monday, wreath-laying ceremony, Republican Plot, Mount St Lawrence Cemetery. LONDON - Easter Monday, Hendon Cemetery, Holders Hill Road, Hendon at the grave of Paddy Hartigan. Meet at main gate, 1pm. LONGFORD - Easter Sunday, commemoration at the grave of Paddy Farrell, Fox Hall Cemetery, Leagan, 3pm. LOUTH - Wreath-laying ceremony at the Republican Plot, St Patrick’s Cemetery, Dundalk. MAYO - Kilkelly, Easter Monday, 12 noon, assemble at Church gate and parade to East Mayo Brigade Memorial on main Sligo-Galway Road. MEATH - Easter Sunday, wreath-laying ceremony at grave of Vol George McDermott, Ardbracken, 2pm. MONAGHAN - Easter Sunday, Urbleshanny Cemetery, Scotstown, at grave of Vol Seámus McElwaine, 2pm. NEW YORK - Easter Rising commemoration and Flannery Award Presentation, Sunday, April 28, 2019 : 9.30am Woodlawn Cemetery and 10.30am Keane’s Restaurant. 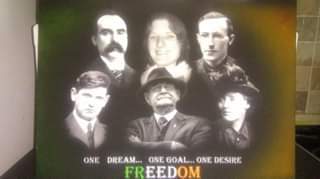 On the closest Sunday to the date of the April 24th, 1916 Easter Rising, CnSN/NIFC will commence its 2019 Easter Commemoration at the grave of CnSN/NIFC co-founder and unrepentant Fenian, Joe Stynes, in Woodlawn Cemetery, Webster Avenue and 233rd St., Bronx, NY 10470, at 10.00am. Grave location: Rose Hill Plot, North Border Road, corner of Elder Ave. Please feel free to bring your family and friends. This year’s theme is the 100th anniversary of the Declaration of Independence at the first Dáil Éireann. The commemoration will begin at 9.30am sharp. An Irish brunch buffet will follow at 10:30am at Keane’s Bar and Restaurant, 4340 Katonah Avenue, Bronx, NY 10470. Tickets are $25 and are available at the door. Children under 14 are free. At Keane’s we will present the 2019 Michael and Pearl Flannery Spirit of Freedom Award to Gary Delaney. A souvenir journal is being produced to mark the event. For more information, contact Jane at 718-683-6903 or Maggie at 845-492-7198. OFFALY - Wreath-laying ceremonies throughout the county. ROSCOMMON - Easter Sunday, Tibohine Cemetery, near Frenchpark, at the grave of John McGowan, shot dead by Crown Forces in 1920, also commemorated will be Thomas McDonagh, killed in action in Ratra Ambush, September 1920. Parade will form up at Tibohine NS at 3.30pm and proceed to cemetery headed by colour party and Raheen Pipe Band. Wreaths will be laid, Roll of Honour read, 1916 Proclamation and Easter Statement will be read, and a graveside oration will be delivered. A wreath-laying ceremony will also take place at the Republican Monument in Ballinlough after 12 noon mass on Easter Sunday. SLIGO - Easter Sunday, wreath-laying ceremony at Republican Plot, Sligo Cemetery. TIPPERARY - Easter Sunday, commemoration, Hunger Strike Memorial, Banba Square, Nenagh, 10am. Easter Sunday, wreath-laying ceremonies at the graves of Joe Mangan and on the Old Barrack Wall to four republicans who were shot in front of a Free State firing squad on the January 15th, 1923, Frederick Burke, Ileigh, Martin O’Shea, Borrisoleigh, Pat Russell, Thurles, and Patrick McNamara, Ballina. TYRONE - Holy Saturday, 5.15pm, wreath-laying ceremony, Carrickmore. WATERFORD - Holy Saturday, wreath-laying ceremony at Statue on Quay, Waterford city. WESTMEATH - Good Friday, commemoration at grave of Paddy Dermody, Fore, 7pm, and wreaths will be laid throughout the county. WEXFORD - Easter Sunday, 11am, wreath-laying ceremony in Crosstown Cemetery at the Republican Plot, 10am and, at 3pm, assemble at Old Dunne’s car park, Crescent Quay, Wexford, for a march to the Republican Garden of Remembrance, Hill Street for the commemoration. And, finally - please be careful not to support non-republican organisations at any time, especially not over the Easter. Not one Irish republican campaigned, fought or died for this corrupt Free State, never mind to end-up applying to it for 'permission' to honour the men and women that it, and its parent administration in London, executed. Thanks for reading - we'll be back in May, with possibly a few words between this and then. Sharon. ARMY FIGHTS FOR FREEDOM, POLITICIANS FOLLOW. ON THIS DATE (10TH APRIL) 96 YEARS AGO : DEATH OF IRA GENERAL, LIAM LYNCH. 'Liam Lynch was born in Barnagurraha, Co Limerick. He joined the Irish Volunteers after witnessing the arrests of the Kent family by British forces after the failed Easter Rising of 1916. Two of the Kent brothers, David and Richard were shot during their arrest. Richard would later die of his wounds and a third brother, Thomas, was executed by Royal Irish Constabulary (RIC). Liam Lynch was born in Barnagurraha, on the Cork-Limerick border, on the 9th of November, 1893, into a republican family - his mother was the secretary of the Ballylanders branch of the Ladies Land League, and his uncle John was one of a party of Volunteers who assembled in Kilmallock on Easter Sunday morning in 1916 to play their part, locally, in the Rising but, due to Eoin MacNeill's 'Countermand Order', the intended insurrection there never happened. Throughout his life, Liam Lynch had no faith in politicians and is on record for declaring that "...the army has to hew the way to freedom for politics to follow.."
And his preference for a military solution ie to 'fight fire with fire' to remove the British military (and political) presence from Ireland was known to the enemy in Westminster, so much so that London instructed their 'Cairo Gang' mercenaries to concentrate on admired soldiers like Lynch and, in their rush to do so, a Sinn Féin councillor, John Lynch, was shot dead by 'Cairo' member Lieutenant Angliss, (aka 'McMahon'- he had been recalled from spy work in Russia for the 'Cairo Gang' job in Dublin) : the British assassin is said to have believed that John Lynch was Liam Lynch, or related to him, but expressed no remorse when his mistake was pointed out to him. The Ciaro man was playing billiard's in Dublin after he killed John Lynch when the IRA shot him, but he was only wounded. He wanted revenge - and the 'Cairo Job' gave him that opportunity, he thought ; in November, 1920, he was in lodgings at 22 Lower Mount Street in Dublin when two of the 'Twelve Apostles' entered his room. He reached for his revolver but was shot dead before he could get to it. '...the dramatic headlines of the papers told the story in graphic form ; "Leaders meeting surprised, Irregular Chief taken near Clonmel, fight in the hills". The text went to say - "Liam Lynch was severely wounded and captured in a fight south of Clonmel yesterday. His death was announced in the following report, recieved from Army G.H.Q. this morning- "Liam Lynch died in Clonmel at 8.45 last evening". Further down the page under the heading "Liam Lynch Dead" and "Mr. De Valera" Narrow Escape", it gave further details and also a short biography of the dead leader. 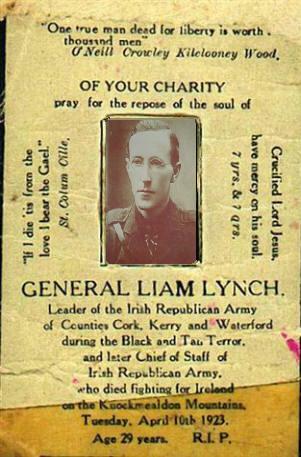 IRA General Liam Lynch died on the 10th of April, 1923, in Clonmel, Tipperary - 96 years ago on this date. From 'The United Irishman' newspaper, December 1954. The 'Manchester Martyrs' were fittingly commemorated in Ladysbridge, County Cork, at 3.30pm, on Sunday, November 21 with a parade of very large dimensions, led by the Cork Volunteers Band, Cork City Fianna Éireann, Cumann na gCailini and Cumann na mBan and consisting of a Colour Party drawn from the Cork No. 1 Brigade IRA, the East Cork Manchester Martyrs Committee, the various Cork City and County IRA units and the following Sinn Féin Cumainn - Cumann Daithe Ceannt, Cumann Mick Fitzgerald, Cumann Tomas MacCurtain, Cumann Brian Dillon, Cumann Tomas Aghas and Cumann Joe Murphy. The representatives of the local national bodies and the general public marched from the monument in Ladybridge to the grave of Captain Willie Cox, IRA Volunteer, and a wreath was laid on the grave of this worthy successor to Allen, Larkin and O'Brien, the Martyrs. The Last Post and Reveille was sounded by the buglers of Na Fianna Éireann as the Brigade Colours dipped in salute and slowly rose again to flutter in the gentle breeze. After this simple but moving ceremony the parade marched back to Ladysbridge to the strains of 'The First Cork Brigade'. On approaching the 'Manchester Martyrs Memorial', the Cork Volunteers Band played the 'Dead March' and the parade slowly moved into position in front of the Monument and Miss Kitty O'Callaghan, from Cumann na mBan, recited a Decade of the Rosary for the repose of the souls of the three Martyrs, a wreath was placed on the Monument and the Last Post and Reveille was sounded by Fianna buglers. Tomas Foley, a member of Cumann Daithi Ceannt, announced the speaker, Michael McCarthy, from Cumann Tomas MacCurtain... (MORE LATER). Born on a Dublin council estate, supporter of the British Army in Ireland and an admirer of Thatcher. From 'Magill' Magazine, May 2002. Patrick Cosgrave was born on a council estate in Dublin but on 'The Late Late Show' called for the British Army to be given its head in the North. He was the quintessential Irish hard-drinker, and adored Maggie Thatcher. Although an Irishman, he became the most unlikely of Conservative crusaders. Brilliant, learned and profoundly loveable, complicated and difficult, impossible : the range of opinion on him is testimony to his unpredictable nature. Hugely talented, his early career was one of immense distinction, but a combination of his drinking and the whims of his political masters meant that, when he died last year, he had long since faded from public view. Those closest to him would argue he deserved much better. Patrick Cosgrave was born in Finglas in 1941, and was only ten years of age when his spendthrift father, a builder, died, plunging the family into poverty. To keep the family afloat, his mother worked as a cleaner in Dublin Castle. Cosgrave was educated by the Christian Brothers at St Vincent's School in Glasnevin, and was known to be a keen reader. It was this latter interest that, perhaps, contributed most to a boy of common Irish background becoming an ardent Anglophile - he spent much of his childhood reading tales of British imperial glories, which helped influence his eventual decision to make his life in England, as well as to the political views which played a key role in both his rise and fall. He also began affecting an upper-class British accent, and quite what his peers made of this is unknown... (MORE LATER). 'THE PEELER AND THE GOAT'. From 'The United Irishman' newspaper, January 1955. Mitchel, 1848 -"I have acted in all this business, from the first, under a strong sense of duty. I do not repent of anything I have done, and I believe that the course which I have opened is only commenced. The Roman, who saw his hand burning to ashes before the tyrant, promised that three hundred should follow out his enterprise. Can I not promise for one - for two - for three - aye, for hundreds..?" ON THIS DATE (10TH APRIL) 152 YEARS AGO : BIRTH OF AN IRISH POET, ARTIST AND MYSTIC. George William Russell ('AE') was born on April 10th, 1867 - 152 years ago on this date - in Lurgan, County Armagh. He made his living as a poet, an artist and a mystic, and was a leading figure in the Irish literary renaissance of the late 19th and early 20th centuries. It was during a proof-reading session by one of his assistants that he adopted a new pseudonym, 'AE', when his then pseudonym, 'AEon' (meaning 'life/vital force') was mentioned by the proof-reader. He became friends with the poet William Butler Yeats when the two of them were attending the 'Metropolitan School of Art' in Dublin - both men were interested in the occult and mysticism, and also shared an interest in the Irish language. To supplement his income, 'AE' Russell worked in the accounts department in a drapery shop but left that position to work with, and in, the agricultural business. At 27 years young, in 1894, he published his first work, 'Homeward : Songs by the Way' and it was during those years in the editor's chair that he published his 'Collected Poems', in 1913 and 1926. Even as the fabled Titan chained upon the hill. And go to death, alone, slowly, and unafraid. 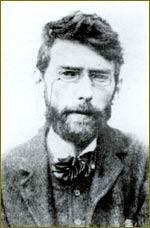 George William Russell ('AE') died on the 17th of July, 1935, in Bournemouth, Hampshire, in England, in his 69th year. And no bad food with adulteration. With no hidden charge in summation..! We won't be posting here next Wednesday, 17th April 2019, because, as you read this, we are two days into rounding-up the 650 tickets which have been distributed since last month for the usual monthly raffle (this one is for the Cabhair organisation), which will be held on Sunday, 14th April next and - more bad news here for ya (!!) - we won't be posting on Wednesday, 24th April either, as we'll be helping out in the background with various Easter Commemorations between when the raffle ends for us - on Monday evening, 15th April - and the weekend following that Monday, which is Easter weekend. And we won't be in Dublin, anyway, on that Wednesday (the 24th), because, immediately following the main Easter Commemoration in Dublin (Easter Monday, 22nd April - assemble at the Garden of Remembrance at 1.45pm, from where the parade will leave, at 2pm, for the GPO) myself and the four girlfriends will be heading off for a two-week break but not, alas, to our usual destination, New York. All five of us couldn't manage the timing for a month-long (or longer!) visit to that extraordinary city, and we are all fully in agreement that the two-week timing that worked for all five of us just simply wasn't long enough for a holiday in NYC - to go there, knowing that we only had two weeks, would annoy all five of us, so we have decided to 'go local' instead. Myself and the rest of the 'Girl Gang' will be accompanied during our two-week 'break' (!) by between about eight and fifteen kids of various ages (our children and our grandchildren, girlfriends/boyfriends of same etc!) and, so far, we have booked one 'away-job'- a two-day overnighter, in County Wicklow (for eleven of us, God help us!) - and two trips to a holiday home owned by one of our number in County Meath (thirteen of us going!). Other than that, we'll be visiting Stephens Green, the zoo in the Phoenix Park, the playgrounds in Corkagh Park and a few other as-yet unplanned outings. We'll make our own craic, no doubt, but it'll be rather more refined than what the five of us get up to in NYC, where we have free rein, no husbands, kids, grandkids etc to restrain us - and BY GOD do we need restraining sometimes (?!) over there! I'll probably still post a few bits and pieces on 'Facebook' and/or 'Twitter', but the '1169' crew are taking a break ; this will be our last post here until at least the middle of May 2019 but, if it's any consolation to ya, I'll bring you back a stick of rock. If the kids and grandkids leave us alone for long enough to do a bit of 'retail therapy', that is...! Thanks for reading, Sharon - we'll be back in May, after our break! A 'LICENSED' EASTER AND A MIS-MATCHED COLLAGE. 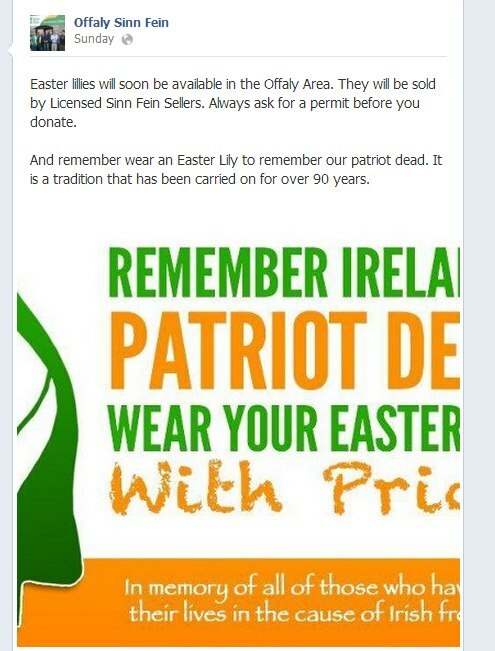 Two examples of political ignorance, as practised by those who apparently consider themselves to be 'republicans' but, judging by that with which they hope to cash-in with this Easter time, are actually 'nationalist'-minded ie they would be more at home, politically, with Fianna Fail/SDLP, and answerable to either Stormont or Leinster House, rather than to any Irish republican institution. 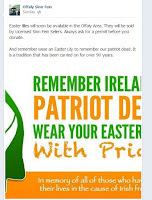 The Easter Lily leaflet/poster on view with this post was produced and distributed by Offaly Sinn Féin (Provisional Sinn Féin, that is...) and included the following text - 'Easter Lillies will soon be available in the Offaly area. They will be sold by Licensed Sinn Féin Sellers. Always ask for a permit before you donate'. A 'licence/permit' to distribute Easter Lilies is granted, upon application, by the Free State administration here in Dublin, the same Free State administration which, since it was spawned by Westminster in 1922, has done its utmost to destroy Irish republicanism, and continues to this day in its attempts to do so. That Free State administration, acting under the guidance of Westminster and, during its 'birth', actually armed by Westminster, turned on Irish republicans, imprisoning, torturing and executing us, as much for its own ends (to maintain the amount of political and military 'control' that Westminster granted it) as for Westminster's (to secure London's 'western front' by planting a friendly [puppet] force in power). No genuine Irish republican would apply to any such political administration for a 'permission slip/licence/permit' to honour the same men and women that were (and are being) hounded in life and death by that same political administration. A Fianna Fáil/SDLP-type 'nationalist', however, wouldn't comprehend the above, as it's above their political 'paygrade'. - to state that Michael Collins, Martin McGuinness and Constance Georgine Gore Booth Markievicz - all of whom ended their days having worked for/with and giving political recognition to, the Free State - had the same '..dream, goal and desire..' as Irish republicans is just as wrong as seeking an Easter Lily permit from the Free Staters in Leinster House. Our regular readers will understand that to be the case and, if any of ye can be bothered, ye mightn't mind educating certain people in Offaly about these things. And, with a bit of luck, they, in turn, might mention it in passin' to the rest of their party at their next get-together...! Tomas O' Dubghaill's speech to the Sinn Féin Ard Fheis, 7th November 1954 (...continued). "It is not a question of personal advantage, nor of party pride - it is a question of the Nation and the future of the Nation. We are serving the very same Cause in our own way as the men who went to Armagh and Omagh. In that spirit we are going into this contest, and we ask for the whole-hearted support of all who treasure the hopes of Irish freedom, to help us make this a success. In mentioning this, it is only right that I should take this opportunity to thank publicly on behalf of the organisation those people who have subscribed so generously to our Northern election fund during recent months, in particular the patrons of Croke Park and the other GAA circles where our collectors were so well received. One final word - the politicians of Leinster House admit they have no solution. They are hoping for a miracle. I would remind them of the words of Ethna Carbery in 'The Shan Van Vocht' in January, 1896, words which are very appropriate today. She said - "Nothing will be accomplished for Ireland by overweening confidence, by empty boasting, by the belief that any favouring circumstances and events occurring outside our own nation will avail to bring us nearer to the goal. The wind and the tide help the ship but they cannot bring her into the port, nor even advance her on her journey. That can be done only by those on board. Ireland will never drift into her desired haven. A few strong hands under the guidance of a few brave resolute hearts can steer her thither before the winds that are now astir, tho' they should grow and blow with a hurricane's strength." Yes, the miracle will come when we get down to work to bring it about." 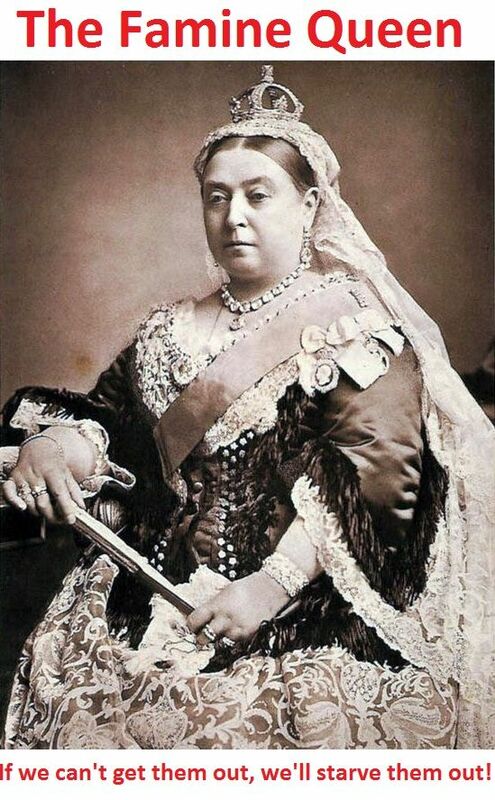 ON THIS DATE (3RD APRIL) 119 YEARS AGO : 'QUEEN OF GENOCIDE' VISITS HER VICTIMS/SUBJECTS. 'Not everyone agreed. Those who cheered were lambasted as traitors by W.B. Yeats. Others questioned why the Queen was not shown the city’s northside where upwards of 200,000 slum-dwellers were living in abject poverty...a large element of Irish nationalists also did not buy into the concept that the Queen’s visit was for the good of her health. Maud Gonne maintained the Queen had taken ‘a shamrock into her withered hand’ solely to stimulate recruitment of Irish soldiers into the British Army. Thousands of Irishmen had already died in the war then raging between Britain and the Boers in South Africa...in 1899, Gonne and Arthur Griffith co-founded the 'Irish Transvaal Committee' (and) amongst their high calibre members were Yeats, James Connolly, Michael Davitt, Willie Redmond and the veteran Fenian John O’Leary. 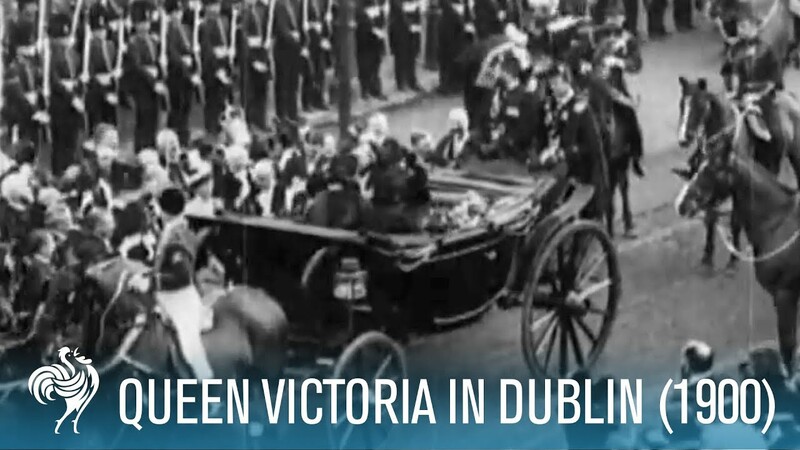 Over the ensuing months they held a number of pro-Boer rallies in Dublin which had led to a notable decline in the numbers volunteering for service...for the Queen’s visit, there was a large increase in military and police presence in the city. There was to be zero tolerance for protests, particularly from the 'Irish Transvaal Committee'. 'Good, you were good, we say. You had no wit to be evil. 'THE SPREADING OF THE NEWS'. 'The Spreading Of The News' or - 'Theirs is not to reason why, theirs is but to sell UI'! O' then, Paddy dear, did you hear the news that's going 'round? The 'UI' is forbid by 'law' to sell in Belfast Town. No more we'll read of soldiers who would pull the Empire down. Free, that is, from Hanna's bans and Basil's plans and Free State knavery! 'BACK TO THE OLD DAYS OF SINN FÉIN'. Waterford Corporation adopted a resolution from the 'Anti-Partition League' asking the US President and British Prime Minister to implement in Ireland their recent declaration in Washington to seek through free elections the unity of nations divided against their will. "We realise from past experience," said Mr J. Griffin, "that what Sir Winston Churchill and the President said was simply platitudinous humbug and no amount of appealing to them to apply fair play to Ireland is going to get us anywhere. We should further cease to appeal to them, except for the purpose of underlining to the world their dishonesty with regard to Ireland. We will, however, have to rely on ourselves. 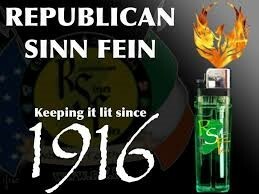 It is back to the old days of Sinn Féin. By Adrian Langan. From 'Magill' Magazine, May 2002. Germany is learning that the best way to achieve that is by accepting that immigration will be a permanent process and changing the law to reflect societal reality. Ireland's constitutional position provides a mechanism to overcome a lot of those mistakes. The system has its drawbacks and there is no doubt that the existing situation is causing enormous problems in maternity hospitals. Many asylum-seekers, quite rationally, may view pregnancy as a solution to the lack of other means to secure a right to stay here. The trend, however, is unquestionable - people will move to Ireland in increasing numbers over the medium to long term and we have a major choice ahead of us in terms of how we choose to respond to those who we will need to work in our society, and will arrive anyway. 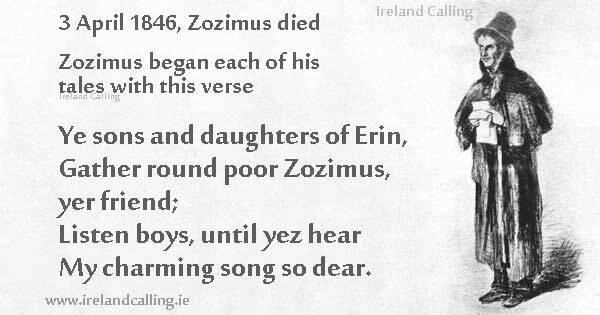 ON THIS DATE (3RD APRIL) 173 YEARS AGO : DEATH OF A DUBLIN CHARACTER. 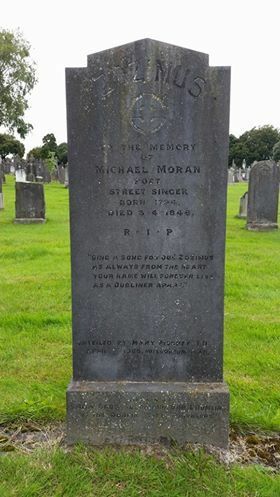 'Michael J. Moran was born circa 1794 in Faddle Alley off the Blackpitts in Dublin's Liberties and lived in Dublin all his life. At two weeks old he was blinded by illness. He developed an astounding memory for verse and made his living reciting poems, many of which he had composed himself, in his own lively style. He was described by songwriter P.J. 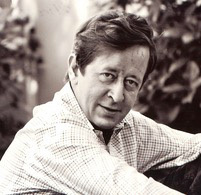 McCall as the last Gleeman of the Pale. Many of his rhymes had religious themes ; others were political or recounted current events. He is said to have worn "a long, coarse, dark, frieze coat with a cape, the lower parts of the skirts being scalloped, an old soft, greasy, brown beaver hat, corduroy trousers and Francis Street brogues, and he carried a long blackthorn stick secured to his wrist with a strap." And buy me a grave. "THIS FLAG DIPS TO NO EARTHLY KING". ON THIS DATE (27TH MARCH) 369 YEARS AGO : KILKENNY FALLS TO A BRITISH CRIMINAL. "I came to Kilkenny in 1650 to suppress the Papist extremists. The city was well fortified, however we breached the walls at St.Francis' Abbey, caused collateral damage to much of the ecclesiastical property and confiscated much private property, exiling leaders of the Confederation and Papist landowners to the West of Ireland..." - Oliver Cromwell, who was born on the 25th April, 1599, and was christened in Saint John the Baptish church in Huntingdon, England, on the 29th of that month. Decades later, when someone was trawling through the birth records for that period, they came across an unofficial addendum to that particular entry : it read - "England's plague for five years". 'March 1650, and the city of Kilkenny was increasingly surrounded. The heart of the Confederate movement since the foundation of that entity, it was now just another beleaguered Royalist stronghold, waiting for the Parliamentarian hammer to fall. The Kilkenny area, including the city, had been put in the overall command of James Tuchet, the Earl of Castlehaven, an appointment he does not really seem to have enjoyed being given. With Ormonde and what existed of the Royalist 'government' fleeing west over the Shannon, Castlehaven was left with a great deal of leeway and authority to attempt to resist Cromwell. What he didn’t have was substantial numbers of men. A bout of plague had rapidly reduced the number of soldiers in the Kilkenny garrison to little more than a few hundred troops, and whatever civilian levy was willing to assist them. Castlehaven’s army, bolstered by a strong-ish regiment of Ulster Army men, reached 3’000 according to his own memoirs, but it’s likely that this is an exaggeration. Ormonde and Castlehaven hoped to be assisted by forces of the Viscount Thomas Dillon, one of the original confederates and a controversial Catholic convert. Accused of corruption and “false musters” by many, Dillon still controlled a few thousand men in the more northerly parts of Leinster that would have greatly aided Castlehaven, but the troops never marched south. Dillon claimed that the troops needed to stay put in case the Ulster Army decided to ravage Leinster ; more likely he did not want to throw them into a losing cause, and as one of the Rinuccini’s former confidantes was unwilling to play second fiddle to the likes of Castlehaven. Castlehaven and his subordinates were on their own. Receiving intelligence from spies among the New Model Army and the Irish countryside, he discovered the marching route of Colonel Hewson’s Dublin column. Marching quickly and avoiding his adversary, Castlehaven swopped on the recently taken town of Athy in Kildare, which (according to him) had a garrison of 700 and a substantial supply of powder. Castlehaven took the place by storm and with very little loss, taking the defenders totally by surprise. But while this was an impressive success, it was relatively meaningless. Castlehaven had taken the action on his own initiative, as Athy was nowhere near where he was supposed to be, and the taking of it could little help Kilkenny. He lacked the men or the supplies to hold Athy, or even to take care of the prisoners he had taken. 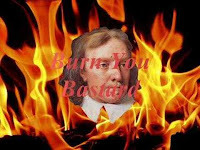 He thus abandoned Athy and his prisoners, hoping Cromwell would recognise the mercy. It was shortly before the massacre at Gowran. 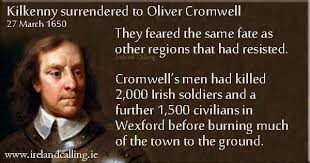 Included in the many other instances when Oliver Cromwell and his army 'kept the peace' was their nine-day siege of Drogheda, which began on the 3rd September in 1649, after which thousands of its inhabitants were butchered. The 'peacekeepers' are also remembered for the infamous 'Death March' that they forced on the survivors after the battle of Dunbar (on the 3rd September 1650) and, one year later on that same date (3rd September), they wallowed in more blood and guts, this time in their own country, at the battle of Worcester. In between the above 'adventures', as we in Ireland know only too well, they 'visited' Kilkenny, which fell to them on this date, 27th March, in the year 1650. "The politicians, by misrepresenting these actions as attacks on the minority in the country, are deliberately falsifying the facts and in effect playing England's game for her. The key to what is called 'the partition question', but which we maintain is more correctly termed 'the conquest of Ireland by division', is contained in the message sent by Lloyd George to Craig in May, 1921, when he said - "Ulster, whether she wills it or not, must not be allowed merge with the rest of Ireland". That was the determination of the British government then, just as it is today, and they enforce that determination by keeping a British Army of occupation in the Six County area. The urgent purpose of the Irish people should be to get those occupation forces out. As the kernel of the Sinn Féin programme is "to deny the right and to oppose the claim of the British Government to rule Ireland or any portion of Ireland", so we delight in the fact that there are still men willing to fight and if necessary to die to get the invaders out of our land. We call on all our people to unite with us in one urgent demand - the British occupation forces must go! England - get out of our country!" IMMEDIATE TASK OF SINN FÉIN. 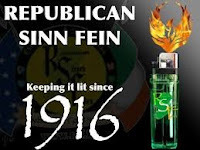 "Sinn Féin, as the civilian arm of the Republican Movement, has a definite part to play. Our immediate task is the contest of all twelve constituencies in the Six Counties area sending representatives to Westminster. We will enter this contest with the demand for the re-establishment of the 32-County Republican Parliament. Our candidates will not take their seats in any other but an All-Ireland Parliament. In contesting these elections, it is our purpose to mobilise every single vote in the Six County area in support of the unity and freedom of our country.." (MORE LATER). ON THIS DATE (27TH MARCH) 101 YEARS AGO : DEATH OF FAMOUS IRISH PRO-INDEPENDENCE ATHLETIC. 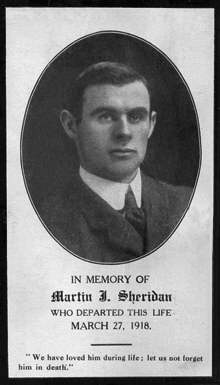 He had emigrated to America in 1899, at only 18 years young, and was not shy about letting people know that he was annoyed that he was forced to emigrate because of the political situation in Ireland, and expressed his opinion that the fact that Ireland was not an independent country "was an injustice which had to end". 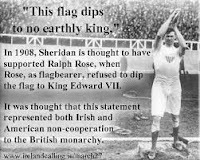 He is perhaps best known for his association with USA-team Flagbearer Ralph Rose who, in 1908, at the London Games, refused to 'dip the flag' to the British 'king', Edward VII, and his 'royal' entourage in the 'royal box' - the 'dipping of the flag' was a symbol of respect for the British 'royal family'. That protest/act of defiance was said to be in support of the Irish struggle against British imperialism and legend has it that Martin John Sheridan, when asked about the incident afterwards, replied "this flag dips to no earthly king", and is apparently the reason why several decisions at those 1908 Games by British judges went against American athletes, which led to some friction between the two countries. By the time he retired from athletics, Martin John Sheridan had won five gold, three silver and one bronze medal at Olympic Games and had also created 16 world records in various track and field disciplines, as well as winning multiple US championships. But he never forgot his Irish roots. 'The 'law' has triumphed. It lay in wait for its victims, like a robber, or a detective, and it has got him at last. The first 'felon' is borne away by England, manacled with her irons and guarded by her soldiers. He is borne from our shores in no stealthy and hurried retreat, over no bloody corpses, after no desperate conflict, but ostentatiously in the open day, amid unarmed citizens, from whom only fall tears and curses. He is borne through an Irish city, carried on Irish seas, degraded within the Irish confines, and no blow is struck for his deliverance. And once again we appeal to all young men who really love this country that for her sake they will unite, organise and arm. Once more we say 'let all the past be blotted out, except the monuments of England's crimes against us, and let the present compel our sole and undivided thoughts'. The recent High Court judgement on the Czech Lobe family has cast this existing system into doubt. The outcome of this case, if upheld in the Supreme Court, would be to effectively negate the provision in the 'Good Friday Agreement' in that an Irish citizen, born in Ireland, would have to effectively abandon their citizenship until they were 18 or remain in Ireland and be separated from their parents. Ireland and other European States are still going to need immigration, even in the context of rising unemployment*. Population growth is slowing and poses a major threat for the labour force base of all advanced industrialised economies. The implications this will have for the tax base and on pensions policy dominates the political agenda right across Europe. It is in this context that this debate in Ireland becomes so central ('1169' comment - Rule Number One = don't let others be solely responsible for setting the 'context/agenda' for this [or any other] discussion/meeting etc you might be having, otherwise you'll find that you have assisted them in 'winning' the day). Immigration will have to occur to fill these gaps but immigration without naturalisation is highly problematic ('1169' comment - as, indeed, is immigration without the proper facilities being in place beforehand). (*'1169' comment - what a ludicrous notion! The portion of the State [financial etc] 'cake' that manages to slip 'down the ladder' - after the powers-that-be have fed, watered and pensioned themselves with the most of it - is inadequate to assist those already in this State and simply cannot be stretched to financially etc properly accommodate the needs and requirements of even more people. It's a new system of distribution that's required, not expecting even more people to try and survive on the crumbs that slip through the greedy net of the 'establishment'.) (MORE LATER). IRISH REPUBLICAN 'INVENTOR OF THE FLYING COLUMN TACTIC' ASSASSINATED BY THE BRITISH. ON THIS DATE (20TH MARCH) 76 YEARS AGO : 21 IRA PRISONERS ESCAPE FROM DERRY JAIL. Early on Saturday morning, 20th March 1943 - 76 years ago on this date - as the Logue family of Harding Street, Derry, were about to sit down for their breakfast, they noticed a part of their small garden rising up and being pushed back - their garden wall formed part of the perimeter of a neighbouring premises, Derry Jail : a figure pulled himself up from the hole in the ground and began assisting others that were trying to scramble to their feet. Within minutes there were 21 men assembled in the small garden, all of whom rushed into the Logue house and let themselves out through the front door. They ran to near-by Abercorn Place and jumped into a waiting lorry, a furniture removal van, which was driven by an on-the-run IRA man, Jimmy Steele, who had recently liberated himself from Crumlin Road Prison! Among the escapees were well-known IRA activists Patrick Donnelly, Ned Maguire, Hugh McAteer, Liam Graham and Brendan O'Boyle who, incidentally, was the last man to be helped from the tunnel. Jimmy Drumm was earmarked as the last man and was in the tunnel, yards behind Brendan O'Boyle, when he heard a warning being shouted that the British Army had discovered the exit and were picking-up the men as they emerged - so he turned back, only to discover later that it was a false alarm. The tunnel had been started in November 1942, in Liam Graham's cell and, out of the 200 or so IRA prisoners in the jail, 22 had been picked by the prisoners themselves as it was felt that that group could more readily 'rally the troops' on the outside as each of them had a high profile in the Movement and were respected by all concerned (except, obviously, by the Brits and the Staters!). An estimated five tons of clay was removed over a five month period and most of it was scattered in the prison grounds, although repeated attempts were made to dispose of some of it via the toilets, which blocked the pipes. A plumbing company was called in on a regular basis over that five month period but, whether they knew what was happening or not, they said nothing and the warders and their bosses knew nothing of the excavation that was then on-going. Indeed, during the last few weeks of the dig, the IRA prisoners had held a 'mini-fleadh cheoil' to cover the noise and the constant comings-and-goings from cell to cell and from cell to prison yard. Jimmy Steele (pictured) and Harry White had each organised to have about 12 men on stand-by on each side of Britain's border in Ireland to assist with the dispersal of the escapees, the majority of whom were taken to Donegal but, within a day, some of their number had been captured by Free State forces and interned in the Curragh. Others were also captured in that county, in a place called Glentown, and they were then held in a FS barracks in Letterkenny. That successful escape effort not only helped to refocus world attention on to the then and on-going struggle for national liberation in Ireland, but proved to be a massive morale boost for the Republican Movement - it helped to insure that the flame stayed lit, and brought in new recruits who, in turn, passed the mantle to those who hold the same values today. "But of course the most significant events during the past year took place in another sphere. I refer to the attacks made by members of the Irish Republican Army on British military garrisons in Ireland. The daring daylight attack on Armagh Barracks in June last and the capturing of the entire stocks in the armoury under the eyes of the British troops was an exhilarating tonic to our people and made the invaders a laughing stock before the world. But the very perfection of its success tended to distract attention from the real lesson of the Armagh raid. Last month, in the early hours of a Sunday morning, the British garrison in Omagh was attacked and a short fierce gun battle ensued in which five British soldiers and two Volunteers were wounded. The laughter was gone - we were now confronted with stark reality. And what is that reality ? Is it not that there is still an army of invaders in our country, that England holds six of our counties by force of arms and that the primary task facing our people is to get those invaders out. The continued presence of the British occupation forces is an act of war against the Irish nation - their presence is an insult and a constant challenge to the Irish people. Thank God we still have young men* ('1169' comment* - men and women, young and old) willing and able to take up that challenge and to answer it in the only way England has ever understood. Of course the politicians North and South have united in condemnation - in that, they are running true to form. But it is very interesting to see how close, almost identical, are the efforts of both Stormont and Leinster House spokesmen (see above comment*) to misrepresent the purpose of the Volunteers. The two attacks were made on the British garrisons, the first time England's troops in Ireland had been attacked since 1921. They were not attacks on fellow Irishmen whether Orange or Green - they were attacks on occupation forces which have absolutely no right to be in Ireland..." (MORE LATER). ON THIS DATE (20TH MARCH) 258 YEARS AGO : BIRTH OF TONE'S COMRADE, ROBERT 'TANNER' SIMMS. On the 20th March, 1761 - 258 years ago on this date - a child called Robert was born into a middle-class, socially-conscious Presbyterian family in Belfast, and grew into adulthood to become the co-owner of a paper mill in Ballyclare, in County Antrim, and he and his brother, William, were also newspaper publishers - they owned 'The Northern Star' newspaper. When he was 31 years of ago, Robert and a group of like-minded individuals - Protestants, Anglicans and Presbyterians - held a public meeting in Belfast, out of which was formed 'The Belfast Society of United Irishmen' (the organisation became a secret society three years later), and one of his colleagues, Sam McTier, was elected as 'President of the Society'. Also present were Theobald Wolfe Tone (who gave Robert Simms his nickname, 'Tanner'), Thomas Russell, William Sinclair, Henry Joy McCracken, Samuel Neilson, Henry Haslett, Gilbert McIlveen, William Simms (Robert's brother), Thomas McCabe, Thomas Pearce and Samuel McTier, among others. 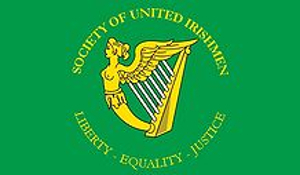 The aims and objectives of the Society were revolutionary for the times that were in it, and brought the organisation to the attention of the less 'socially-minded' political (and military) members of the British ruling-class in Dublin, which was then (and, indeed, now!) England's political power-base in Ireland - "That the weight of English influence in the government of this country is so great, as to require a cordial union among all the people of Ireland, to maintain that balance which is essential to the preservation of our liberties and the extension of our commerce...the sole constitutional mode by which this influence can be opposed, is by a complete and radical reform of the representation of the people in Parliament..."
The Belfast Society also adopted the 'Charter' of 'The United Irishmen' as a whole, and in so doing they drew further attention on themselves from their political enemies, at home and abroad - "In the present era of reform, when unjust governments are falling in every quarter of Europe, when religious persecution is compelled to abjure her tyranny over conscience, when the rights of men are ascertained in theory, and theory substantiated by practice, when antiquity can no longer defend absurd and oppressive forms, against the common sense and common interests of mankind, when all governments are acknowledged to originate from the people, and to be so far only obligatory, as they protect their rights and promote their welfare, we think it our duty, as Irishmen, to come forward, and state what we feel to be our heavy grievance, and what we know to be its effectual remedy. We have no national government, we are ruled by Englishmen, and the servants of Englishmen, whose object is the interest of another country, whose instrument is corruption, and whose strength is the weakness of Ireland; and these men have the whole of the power and patronage of the country, as means to seduce and subdue the honesty of her representatives in the legislature. Such an extrinsic power, acting with uniform force, in a direction too frequently opposite to the true line of our obvious interest, can be resisted with effect solely by unanimity, decision, and spirit in the people, qualities which may be exerted most legally, constitutionally, efficaciously, by the great measure, essential to the prosperity and freedom of Ireland, an equal representation of all the people in parliament. Impressed with these sentiments...we do pledge ourselves to our country, and mutually to each other..."
Both Robert and his brother, William, served time in Newgate Prison and were transported from there to Fort George Prison in Scotland, and it was between their imprisonment and their deportation that the 'Northern Star' office was burned down. When they were released, Robert was appointed to the position of 'Commander' of the 'United Irishmen' in County Antrim, but never settled-in to the position, as he didn't believe that he was capable of successfully fulfilling the role and he also felt uneasy about directly challenging the British presence in Ireland unless military assistance was available from the French, but to wait for same was not the preferred option of the organisation overall. Robert Simms, born on the 20th March 1761 - 258 years ago on this date - died on the 23rd June, 1843. LETTER TO 'THE EDITOR, UI', FROM EAMON BOYCE, POW. Before starting, I want to apologise for the writing etc in this, as it is written out of necessity, in rather a hurry. By now, this 'trial' is probably finished ; actually, the whole affair is a bit of a joke. However, I feel proud of being compared, even in this manner, with that great Irish patriot John Mitchel. I regret my present position for one reason - a man in jail is useless to his country*. However, it was God's Will that events should take this course, and I trust that by our example during this trial, we may have set an example to other young men, and women, too, in Ireland. I am, thank God, an Irishman, and never before has it been brought home to me as forcibly as now. As I looked around me today I thought of these people with a certain amount of pity, of course the mere sight and sound of the English soldiers filled me with revulsion. However, I hope and pray that our sacrifice will not be in vain - deep down, the Irish people will not fail when they are called. This must sound like a page from 'The United Irishman' newspaper but I am merely transferring my feelings to paper. Please convey my warmest wishes to all my comrades and friends and, regarding yourself and your friend, I can honestly say that I feel very honoured and privileged to have known you both so well. I am sorry that events did not work out well, but in one respect we Irish never really fail in our fight. God is with us, and with His help the time is close at hand when our country will be freed. In this letter I have cast aside all caution, let them produce it in court if they wish, but I would like to know if you receive it intact. Please convey my very warmest wishes to your mother and all the family, also to 'G'. (END of 'LETTER TO 'THE EDITOR, UI', FROM EAMON BOYCE, POW'. NEXT - 'TIMES HAVE NOT CHANGED', from the same source). ON THIS DATE (20TH MARCH) - IRISH REVOLUTIONARY BORN 135 YEARS AGO AND ASSASSINATED ON THE SAME DATE 99 YEARS AGO. Tomás MacCurtain (pictured) was born on this date (20th March) in 1884, at Ballyknockane, Mourne Abbey (Mainstir na Móna), County Cork ; he was the 12th and last child of Patrick Curtin, a farmer, and Julia Sheehan. His interest in Irish culture and history led him to join Conradh na Gaeilge, Na Fianna Éireann and the 'Irish Volunteer' organisation, which he assisted in establishing in Cork city. He was the first Irish republican to hold the 'Lord Mayor' office and was elected to that position on the 31st January 1920, at 36 years of age. He was assassinated by the British at his home in Thomas Davis Street in Blackpool, Cork, between 12.10am and 1.15am on the 20th March 1920, which was his 36th birthday - his killers, dressed in 'civvies' and spoke with pronounced English accents. They were RIC members tasked with the 'job' by their political bosses in Westminster. He was buried in the Republican Plot in St. Finbarr's Cemetery in Cork on Monday 22nd March 1920. "We find that the late Alderman MacCurtain, Lord Mayor of Cork, died from shock and hemorrhage caused by bullet wounds, and that he was wilfully murdered under circumstances of the most callous brutality, and that the murder was organised and carried out by the Royal Irish Constabulary, officially directed by the British Government, and we return a verdict of wilful murder against David Lloyd George, Prime Minister of England ; Lord French, Lord Lieutenant of Ireland ; Ian McPherson, late Chief Secretary of Ireland ; Acting Inspector General Smith, of the Royal Irish Constabulary ; Divisional Inspector Clayton of the Royal Irish Constabulary ; District Inspector Swanzy and some unknown members of the Royal Irish Constabulary. We strongly condemn the system at present in vogue of carrying out raids at unreasonable hours. We tender to Mrs MacCurtain and family our sincerest sympathy. We extend to the citizens of Cork our sympathy in the loss they have sustained by the death of one so eminently capable of directing their civic administration" - the unanimous verdict of the inquest into the murder of Alderman Tomás MacCurtain, Lord Mayor of Cork and considered by many to be the 'inventor' of the 'Flying Column' tactic, as read out on 17th April 1920 by Coroner James J. McCabe. Such was the level of international condemnation of the assassination, especially after Lloyd George attempted to blame Irish republicans themselves on having carried it out to generate publicity for their campaign, that Westminster let it be known that they had 'questioned' sixty-four of their 'policemen' in Ireland along with two British military operatives and thirty-one civilians in connection with the killing. WHEN AN IRISH CITIZEN IS NOT A CITIZEN... By Adrian Langan. From 'Magill' Magazine, May 2002. The official position in Irish law is that 'anyone born in Ireland is automatically an Irish citizen and anyone whose father or mother was Irish at the time of the person's birth is also automatically Irish'. 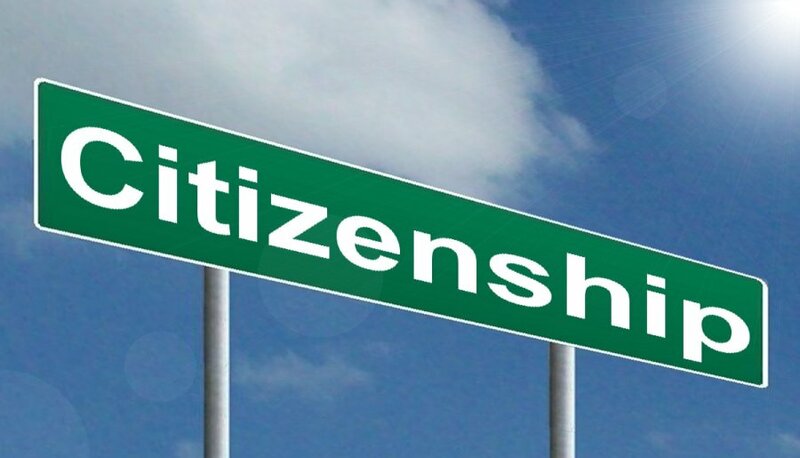 What other options are there for determining the right to citizenship? You could use jus sanguinis (the 'law of blood') which would be highly problematic as it would imply that there is an Irish 'gene' or 'race' to be identified. The mechanism at the moment has a wonderful simplicity to it - if you are born here you can stay here and have a full legal entitlement to remain here. The increasingly globalised economy now means that people are moving across State boundaries and will continue to move. In trade agreements, labour is the one factor of production whose movement is not being liberalised. Despite this, the reality is that more and more people who are not of Irish birth will be living and working in Ireland and they will be having children who will be Irish citizens. What do we do with the relatives of the Irish-citizen baby? Since it is highly unlikely in the current climate that any Irish government (sic) would seek to have a referendum to change any provisions of the 'Good Friday Agreement' ('1169' comment - "Not one of England’s Treaties with Ireland or any Agreement or any Declaration was ever about her leaving us in peace but rather they have been about perpetuating her power in the Six Counties and always at the expense of Irish democracy..." - from here), this question comes into sharp focus. The position up to this point has been that they are entitled to stay with their children until the child is 18 years of age and, by then, the parents have become naturalised and given full citizenship... (MORE LATER).